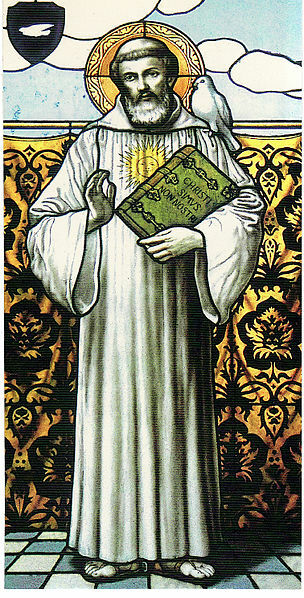 St. Columbanus founder of the Luxeuil Abbey. His life was written by Jonas, an Italian monk of the Columban community, at Bobbio, c. 643. This author lived during the abbacy of Attala, Columbanus’s immediate successor, and his informants had been companions of the saint. 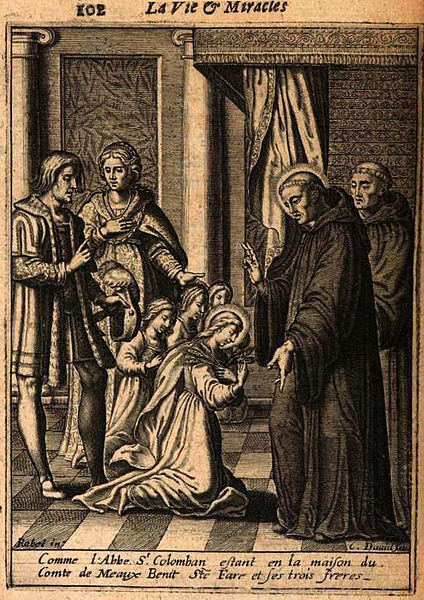 Mabillon in the second volume of his “Acta Sanctorum O.S.B.” gives the life in full, together with an appendix on the miracles of the saint, written by an anonymous member of the Bobbio community. Columbanus set sail with twelve companions; their names have thus come down to us: St. Attala, Columbanus the Younger, Cummain, Domgal, Eogain, Eunan, St. Gall, Gurgano, Libran, Lua, Sigisbert and Waldoleno (Strokes, “Apennines”, p. 112). The little band passed over to Britain, landing probably on the Scottish coast. They remained but a short time in England, and then crossed over to France, where they arrived probably in 585. At once they began their apostolic mission. Wherever they went the people, were struck by their modesty, patience, and humility. France at that period needed such a band of monks and preachers. Owing partly to the incursions of barbarians, and partly due to the remissness of the clergy, vice and impiety were prevalent. Columbanus, by his holiness, zeal, and learning, was eminently fitted for the work that lay before him. He and his followers soon made their way to the court of Gontram, King of Burgundy. Jonas calls it the court of Sigisbert, King of Austrasia and Burgundy, but this is manifestly a blunder, for Sigisbert had been slain in 575. The fame of Columbanus had preceded him. Gontram gave him a gracious reception, inviting him to remain in his kingdom. The saint complied, and selected for his abode the half-ruined Roman fortress of Annegray in the solitudes of the Vosges Mountains. Here the abbot and his monks led the simplest of lives, their food oftentimes consisting of nothing but forest herbs, berries, and the bark of young trees. The fame of Columbanus’s sanctity drew crowds to his monastery. 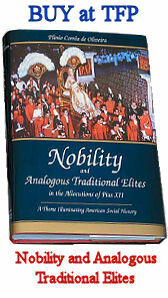 Many, both nobles and rustics, asked to be admitted into the community. Sick persons came to be cured through their prayers. But Columbanus loved solitude. Often he would withdrew to a cave seven miles distant, with a single companion, who acted as messenger between himself and his brethren. After a few years the ever-increasing number of his disciples oblige him to build another monastery. Columbanus accordingly obtained from King Gontram the Gallo-Roman castle named Luxeuil, some eight miles distant from Annegray. It was in a wild district, thickly covered with pine forests and brushwood. 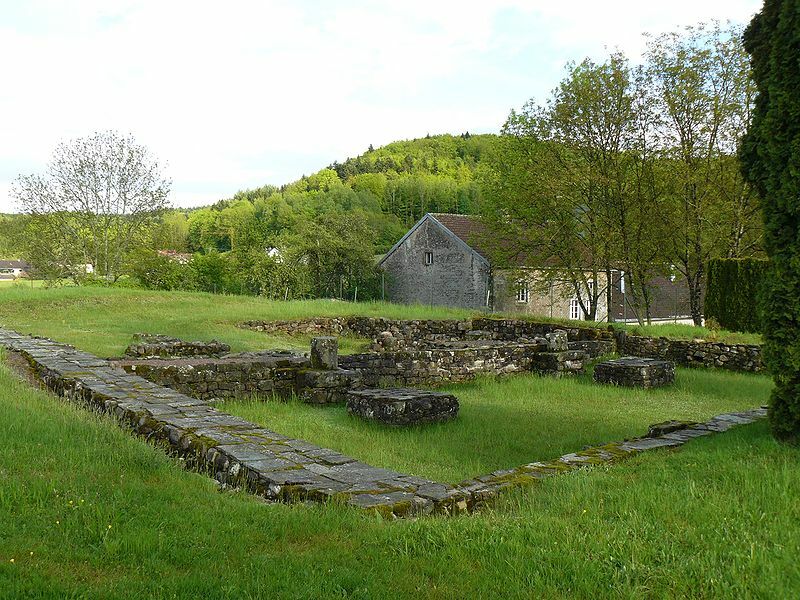 This foundation of the celebrated Abbey of Luxueil, took place in 590. But these two monasteries did not suffice for the numbers who came, and a third had to be erected at Fontaines. The superiors of these houses always remained subordinate to Columbanus. It is said this time, he was able to institute a perpetual service of praise, known as Laus perennis, by which choir succeded choir, both day and night (Montalembert, Monks of the West II, 405). For these flourishing communities he wrote his rule, which embodies the customs of Bangor and other Celtic monasteries. Monastery ruins of the Annegray Priory founded by Saint Columban in 595. For wellnigh twenty years Columbanus resided in France and during that time observed the unreformed paschal computation. But a dispute arose. The Frankish bishops were not too well disposed towards this stranger abbot, because of his ever-increasing influence, and at last they showed their hostility. They objected to his Celtic Easter and his exclusion of men as well as women from the precincts of his monasteries. The councils of Gaul held in the first half of the sixth century had given to bishops absolute authority over religious communities, even going so far as to order the abbots to appear periodically before their respective bishops to receive reproof or advice, as might be considered necessary. These enactments, being contrary to the custom of the Celtic monasteries, were readily accepted by Columbanus. In 602 the bishops assembled to judge him. He did not appear, lest, as he tells us, “he might contend in words”, but instead addressed a letter to the prelates in which he speaks with a strange mixture of freedom, reverence, and charity. In it he admonishes them to hold synods more frequently, and advises that they pay attention to matters equally important with that of the date of Easter. As to his paschal cycle he says: “I am not the author of this divergence. I came as a poor stranger into these parts for the cause of Christ, Our Saviour. 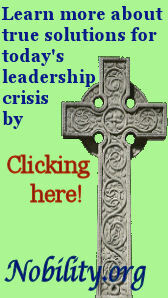 One thing alone I ask of you, holy Fathers, permit me to live in silence in these forests, near the bones of seventeen of my brethren now dead.” When the Frankish bishops still insisted that the abbot was wrong, then, in obedience to St. Patrick’s canon, he laid the question before Pope St. Gregory. He dispatched two letters to that pontiff, but they never reached him, “through Satan’s intervention”. The third letter is extant, but no trace of an answer appears in St. Gregory’s correspondence, owing probably to the fact that the pope died in 604, about the time it reached Rome. In this letter he defends the Celtic custom with considerable freedom, but the tone is affectionate. He prays “the holy Pope, his Father”, to direct towards him “the strong support of his authority, to transmit the verdict of his favour”. Moreover, he apologizes “for presuming to argue as it were, with him who sits in the chair of Peter, Apostle and Bearer of the Keys”. He directed another epistle to Pope Boniface IV, in which he prays that, if it be not contrary to the Faith, he confirm the tradition of his elders, so that by the papal decision (judicium) he and his monks may be enabled to follow the rites of their ancestors. Before Pope Bonifice’s answer (which has been lost) was given, Columbanus was outside the jurisdiction of the Frankish bishops. As we hear no further accusation on the Easter question — not even in those brought against his successor, Eustasius of Luxeuil in 624 — it would appear that after Columbanus had removed into Italy he gave up the Celtic Easter (cf. Acta SS. O.S.B., II, p. 7). In addition to the Easter question Columbanus had to wage war against vice in the royal household. The young King Thierry, to whose kingdom Luxeuil belonged, was living a life of debauchery. He was completely in the hands of his grandmother, Queen Brunehault (Brunehild). On the death of King Gontram the succession passed to his nephew, Childebert II, son of Brunehault. At his death the latter left two sons, Theodebert II and Thierry II, both minors. Theodebert succeeded to Austrasia, Thierry to Burgundy, but Brunehault constituted herself their guardian, and held in her own power the governments of the two kingdoms. As she advanced in years she sacrificed everything to the passion of sovereinity, hence she encouraged Thierry in the practice of concubinage in order that there might be no rival queen. Thierry, however, had a veneration for Columbanus, and often visited him. On these occasions the saint admonished and rebuked him, but in vain. Brunehault became enraged with Columbanus, stirred up the bishops and nobles to find fault with his rules regarding monastic enclosure. Finally, Thierry and his party went to Luxeuil and ordered the abbot to conform to the usages of the country. Columbanus refused, whereupon he was taken prisoner to Besancon to await further orders. Taking advantage of the absence of restraint he speedily returned to his monastery. On hearing this, Thierry and Brunehault sent soldiers to drive him back to Ireland. None but Irish monks were to accompany him. Accordingly, he was hurried to Nevers, made to embark on the Loire, and thus proceed to Nantes. At Tours he visited the tomb of St. Martin and sent a message to Thierry that within three years he and his children would perish. At Nantes, before the embarkation, he addressed a letter to his monks, full of affection. It is a memorial of the love and tenderness which existed in that otherwise austere and passionate soul. In it he desires all to obey Attala, whom he requests to abide with the community unless strife should arise on the Easter question. His letter concludes thus “They come to tell me the ship is ready. The end of my parchment compels me to finish my letter. Love is not orderly; it is this which has made it confused. Farewell, dear hearts of mine; pray for me that I may live in God.” As soon as they set sail, such a storm arose that ship was driven ashore. The captain would have nothing more to do with these holy men; they were thus free to go where they pleased. Columbanus made his way to the friendly King Clothaire at Soissons in Neustria where he was gladly welcomed. Clothaire in vain pressed him to remain in his territory. Columbanus left Neustria in 611 for the court of King Theodebert of Austrasia. At Metz he received an honourable welcome, and then proceeding to Mainz, he embarked upon the Rhine in order to reach the Suevi and Alamanni, to whom he wished to preach the Gospel. Ascending the river and its tributaries, the Aar and the Limmat, he came to the Lake of Zurich. Tuggen was chosen as a centre from which to evangelize, but the work was not successful. Instead of producing fruit, the zeal of Columbanus only excited persecution. In despair he resolved to pass on by way of Arbon to Bregenz on Lake Constance, where there were still some traces of Christianity. Here the saint found an oratory dedicated to St. Aurelia, into which the people had brought three brass images of their tutelary deities. He commanded St. Gall, who knew the language, to preach to the inhabitants, and many were converted. The images were destroyed, and Columbanus blessed the little church, placing the relics of St. Aurelia beneath the altar. A monastery was erected, and the brethren forthwith observed their regular life. After about a year, in consequence of another rising against the community, Columbanus resolved to cross the Alps into Italy. An additional reason for his departure was the fact that the arms of Thierry had prevailed against Theodebert, and thus the country on the banks of the Upper Rhine had become the property of his enemy. On his arrival at Milan in 612, Columbanus met with a kindly welcome from King Agilulf and Queen Theodelinda. He immediately began to confute the Arians and wrote a treatise against their teaching, which has been lost. At the request of the king, he wrote a letter to Pope Boniface on the debated subject of “The Three Chapters”. 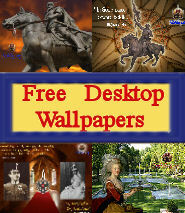 These writings were considered to favour Nestorianism. Pope St. Gregory, however, tolerated in Lombardy those persons who defended them, among whom was King Agilulf. Columbanus would probably have taken no active part in this matter had not the king pressed him so to do. But on this occasion his zeal certainly outran his knowledge. The letter opens with all apology that a “foolish Scot” should be charged to write for a Lombard king. He acquaints the pope with the imputations brought against him, and he is particularly severe with the memory of Pope Vigilius. He entreats the pontiff to prove his orthodoxy and assemble a council. He says that his freedom of speech accords with the usage of his country. 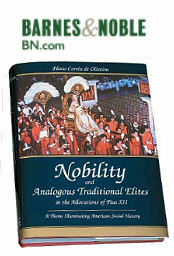 “Doubtless”, Montalembert remarks, “some of the expressions which he employs should be now regarded as disrespectful and justly rejected But in those young and vigorous times, faith and austerity could be more indulgent” (II, 440). On the other hand, the letter expresses the most affectionate and impassioned devotion to the Holy See. The whole, however, may be judged from this fragment: “We Irish, though dwelling at the far ends of the earth, are all disciples of St. Peter and St. Paul . . . Neither heretic, nor Jew, nor schismatic has ever been among us; but the Catholic Faith, Just as it was first delivered to us by yourselves, the successors of the Apostles, is held by us unchanged . . . we are bound [devincti] to the Chair of Peter, and although Rome is great and renowned, through that Chair alone is she looked on as great and illustrious among us . . .On account of the two Apostles of Christ, you [the pope] are almost celestial, and Rome is the head of the whole world, and of the Churches”. If zeal for orthodoxy caused him to overstep the limits of discretion, his real attitude towards Rome is sufficiently clear. He declares the pope to be: “his Lord and Father in Christ”, “The Chosen Watchman”, “The Prelate most dear to all the Faithful”, “The most beautiful Head of all the Churches of the whole of Europe”, “Pastor of Pastors”, “The Highest”, “The First”, “The First Pastor, set higher than all mortals”, “Raised near into all the Celestial Beings”, “Prince of the Leaders”, “His Father”, “His immediate Patron”, “The Steersman”, “The Pilot of the Spiritual Ship” (Allnatt, “Cathedra Petri”, 106). But it was necessary that, in Italy, Columbanus should have a settled abode, so the king gave him a tract of land called Bobbio, between Milan and Genoa, near the River Trebbia, situated in a defile of the Apennines. On his way thither he taught the Faith in the town of Mombrione, which is called San Colombano to this day. 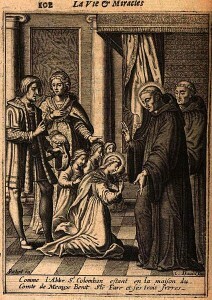 Padre della Torre considers that the saint made two journeys into Italy, and that these have been confounded by Jonas. On the first occasion he went to Rome and received from Pope Gregory many sacred relics (Stokes, Apennines, 132). This may possibly explain the traditional spot in St. Peter’s, where St. Gregory and St. Columba are supposed to have met (Moran, Irish SS. in Great Britain,105). At Bobbio the saint repaired the half-ruined church of St. Peter, and erected his celebrated abbey, which for centuries was stronghold of orthodoxy in Northern Italy. Thither came Clothaire’s messengers inviting the aged abbot to return, now that his enemies were dead. But he could not go. He sent a request that the king would always protect his dear monks at Luxeuil. He prepared for death by retiring to his cave on the mountain-side overlooking the Trebbia, where, according to a tradition, he had dedicated an oratory to Our Lady (Montalembert, “Monks of the West”, II, 444). His body has been preserved in the abbey church at Bobbio, and many miracles are said to have been wrought there through his intercession. 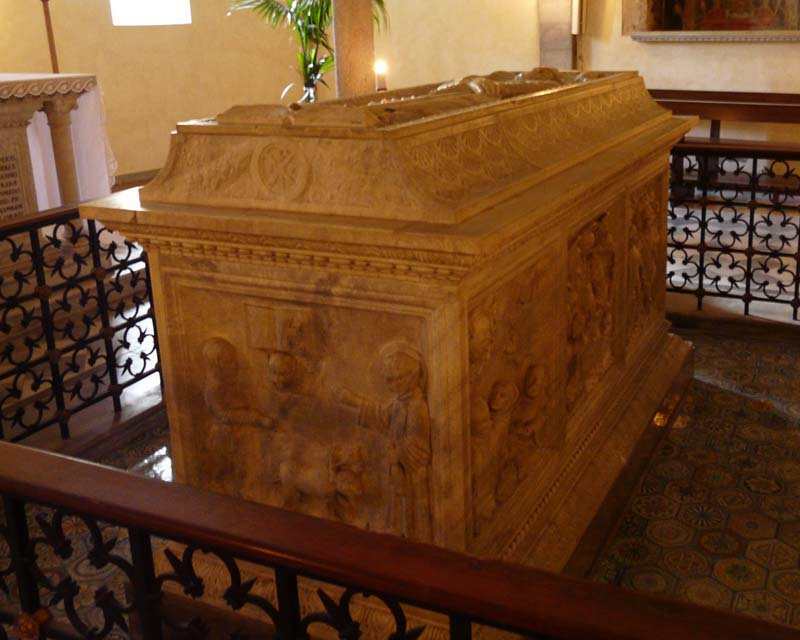 In 1482 the relics were placed in a new shrine and laid beneath the altar of the crypt, where they are still venerated. But the altar and shrine are once more to be restored, and for this end in 1907 all appeal was made by Cardinal Logue, and there is every prospect of the work being speedily accomplished. The sacristy at Bobbio possesses a portion of the skull of the saint, his knife, wooden cup, bell, and an ancient water vessel, formerly containing sacred relics and said to have been given him by St. Gregory. According to certain authorities, twelve teeth of the saint were taken from the tomb in the fifteenth century and kept in the treasury, but these have now disappeared (Stokes, Apennines, p. 183). St. Columbanus is named in the Roman Martyrology on 21 November, but his feast is kept by the Benedictines and throughout Ireland on 24 November. 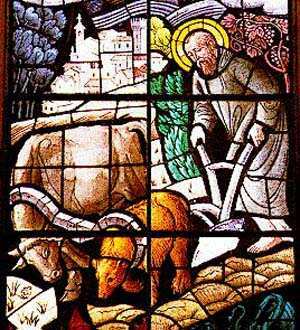 Among his principal miracles are: (1) procuring of food for a sick monk and curing the wife of his benefactor; (2) escape from hurt when surrounded by wolves; (3) obedience of a bear which evacuated a cave at his biddings; (4) producing a spring of water near his cave; (5) repletion of the Luxeuil granary when empty; (6) multiplication of bread and beer for his community; (7) curing of the sick monks, who rose from their beds at his request to reap the harvest; (8) giving sight to a blind man at Orleans; (9) destruction by his breath of a cauldron of beer prepared for a pagan festival; (10) taming a bear, and yoking it to a plough. Like other men, Columbanus was not faultless. In the cause of God he was impetuous and even head-strong, for by nature he was eager, passionate, and dauntless. These qualities were both the source of his power and the cause of mistakes. But his virtues were very remarkable. He shared with other saints a great love for God’s creatures. As he walked in the woods, the birds would alight upon his shoulder that he might caress them and the squirrels would run down from the trees and nestle in the folds of his cowl. The fascination of his saintly personality drew numerous communities around him. That he possessed real affection for others is abundantly manifest in his letter to his brethren. Archbishop Healy eulogises him thus: “A man more holy, more chaste, more self-denying, a man with loftier aims and purer heart than Columbanus was never born in the Island of Saints” (Ireland’s Ancient Schools, 378). Regarding his attitude towards the Holy See, although with Celtic warmth and flow of words he could defend mere custom, there is nothing in his strongest expressions which implies that, in matters of faith, he for a moment doubted Rome’s supreme authority. His influence in Europe was due to the conversions he effected and to the rule that he composed. What gave rise to his apostolate? Possibly the restless energy of the Celtic character, which, not finding sufficient scope in Ireland, directed itself in the cause of Christ to foreign lands. It may be that the example and success of St. Columba in Caledonia stimulated him to similar exertions. The example, however, of Columbanus in the sixth century stands out as the prototype of missionary enterprise towards the countries of Europe, so eagerly follows up from England and Ireland by such men as Killian, Virgilius, Donatus, Wilfrid, Willibrord, Swithbert, and Boniface. If Columbanus abbey in Italy became a citadel of faith and learning, Luxeuil in France became the nursery of saints and apostles. From its walls went forth men who carried his rule, together with the Gospel, into France, Germany, Switzerland, and Italy. There are said to have been sixty-three such apostles (Stokes, Forests of France, 254). These disciples of Columbanus are accredited with founding over one hundred different monasteries (ib., 74). The canton and town still bearing the name of St. Gall testify how well one disciple succeeded. Columbanus has left us his own writings. They demonstrate that his attainments were of no mean order. He continued his literary studies till the very eve of his death. His works (Migne P.L. LXXX) include: (1) “Penitencial” which prescribes penances according to guilt, a useful guide in the absence of elaborate treatises on moral theology; (2) “Seventeen short Sermons“; (3) “Six Epistles”; (4) “Latin Poems”; (5) “A Monastic Rule”. This Last is much shorter than that of St. Benedict, consisting of only ten chapters. The first six of these treat of obedience, silence, food, poverty, humility, and chastity. In these there is much in common with the Benedictine code, except that the fasting is more rigorous. Chapter vii deals with the choir Offices. Sunday Martins in winter consisted of seventy-five psalms and twenty-five antiphone—three psalms to each antiphone. In spring and autumn these were reduced to thirty-six, and in summer to twenty-four, Fewer were said on week days. The day hours consisted of Terce, Sext, None, and Vespers. Three psalms were said at each of these Offices, except Vespers, when twelve psalms were said. Chapter x regulates penances for offences, and it is here that the Rule of St. Columbanus differs so widely from that of St. Benedict. Stripes or fasts were enjoined for the smallest faults. The habit of the monks consisted of a tunic of undyed wool, over which was worn the cuculla, or cowl, of the same material. A great deal of time was devoted to various kinds of manual labour. The Rule of St: Columbanus was approved of by the Council of Macon in 627, but it was destined before the close of the century to be superseded by that of St. Benedict. For several centuries in some of the greater monasteries the two rules were observed conjointly. In art St. Columbanus is represented bearded bearing the monastic cowl, he holds in his hand a book with an Irish satchel, and stands in the midst of wolves. Sometimes he is depicted in the attitude of taming a bear, or with sunbeams over his head (Husenheth, “Emblems”, p. 33). Previous post: November 22 – Christ the King? Or Christ the President?